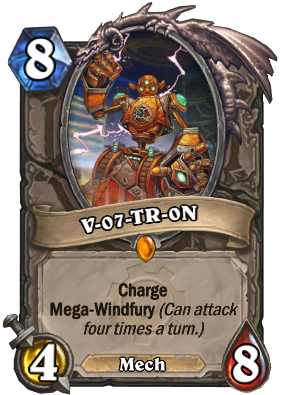 Hearthstone Patch 7835 brought us a new summoning animation for V-07-TR-0N! He'll live in our hearts... and experimental quest mage decks. I would use in constructed. That would be over-powered if you could. I've literally never seen this card. in a mech mage deck it's deadly.... with mechwarpers you can bring him out sooner..... though it's important to have board control. 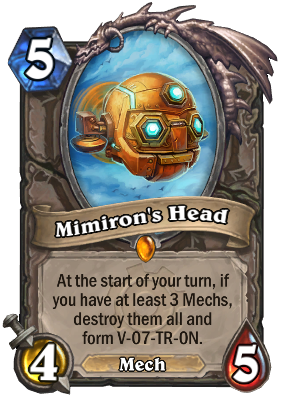 some taunts like annoyatron to delay the enemy also helps give you time to bring out mimiron to summon x51 on the next turn. if one of your earlier cards was a clockwork, and you trade and get lucky with a swap hp and attack card, that is excellent for mimiron because he now hits hard 4 times in a row. but there's a higher risk for him to die. Yeah this card would be played in every single deck in Hearthstone if it was craft-able lol. I have never played the card but wouldn't this be a huge sacrifice if it just gets silenced? I guess you'd have to take into consideration the mechs that it's eating but still. I just think you might get better value out of the mechs that this thing would eat! exactly, wait for it to essentially kill all his minions then silence it but it would still have done 16 dmg it's got charge. Some people will let you win just so they can see him being played. Very rare occurrence. Since it has an attribute called "mega windfury" has anyone tried giving it regular windfury? I'm assuming this doesn't work because being able to attack eight times in one turn is kinda silly. Quote from Twitter after this question was pitched to Ben Brode. EDIT: to make this clearer it will still only attack 4 times in total, Mega Windfury takes preference although mousing over teh card will show a wind fury buff, but it has no affect. I think rogue is basically the only class that can use this card effectively, since they have conceal. Otherwise, it should be easy to kill off at least a couple mechs (unless the person is really far behind).